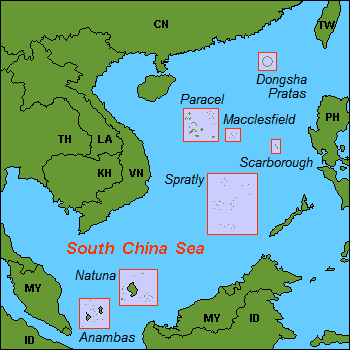 The South China Sea is very important and it has always been that. It is a marginal sea that is part of the Pacific Ocean, encompassing an area from the Singapore and Malacca Straits to the Strait of Taiwan of around 3,500,000 square kilometers. The big question is; who is owning the sea? China are ignoring its neighbours, claiming that The South China Sea belongs to China, but other countries doesn`t agree with that, and here starts the tension. China and Vietnam have both been vigorous in prosecuting their claims. China (various governments) and South Vietnam each controlled part of the Parcel Island before 1974, so this conflict is not something new. In July 2010, US Secretary of State Hillary Clinton called for the Peoples Republic of China to resolve the territorial dispute. China responded by demanding the US keep out of the issue. This came at a time when both countries have been engaging in naval exercises in a show of force to the opposing side, which increased tension in the region. «In the disputed waters of the South China Sea, the United States does not privilege the claims of one nation over another, but we do unapologetically stand up for the equitable and peaceful resolution of disputes and for the freedom of navigation, and today these principles are being tested by Chinese activities in the South China Sea. U.S foreign policy is rebalancing toward the vast potential of the Asia-Pacific region, but we cant succeed if you dont show up. That`s why 60% of the United States Naval Forces will be stationed in the Asia-Pacific by 2020. I repeat what Vice President Joe Biden said: 60% of the United States Naval Forces will be stationed in the Asia-Pacific by 2020. This is a conflict that will continue in years to come, and it is a dangerous conflict. A war between the United States and China will be catastrophic for them both. First of all, Chia is a huge supplier for American merchants. A strong dollar against a cheap Yuan is profitable for Americans, but a war can change that. China has been steadily accumulating US treasury securities for decades. Additionally, trade data from the US Census Bureau shows that China has been running a big trade surplus with the US since 1985. This means that China sells more goods and services to the US, than the US sells to China. Will China try to «buy out» the US markets through its debt accumulation? The war with China right now is not a currency war. Nor is it a trade war. No, it is a real military war which is not hypothetical anymore. It`s real.